Muscle pain affects most individuals at some point in their lives; often it is caused by physical activity that results in muscle strain or sprain. Chronic, widespread muscle pain or “myofascial pain syndrome” may be a symptom of an underlying or co-existing medical condition such as fibromyalgia, chronic fatigue syndrome, multiple sclerosis or arthritis. When muscle pain is chronic, it is critically important to receive an accurate and complete diagnosis to determine what is causing your discomfort, so it can be addressed appropriately. At the Kaplan Center our physicians have years of experience treating patients with chronic pain conditions, and we completely reject the notion that “you just have to live with it.” Whether you are searching for a diagnosis for your muscle pain or have already been diagnosed, but have yet to find a long-lasting and effective treatment, the Kaplan Center can help. At your first visit, your Kaplan physician will take time exploring the onset of your condition, the specific nature of your symptoms and the overall status of your health. You’ll also be asked about the medications and therapies you’ve tried in the past, and what has and hasn’t worked for you. To gather additional information about your condition, specialized diagnostic laboratory testing may be necessary. After reviewing all of the factors contributing to your condition, your physician will spend time talking with you about your diagnosis and working with you to create a customized and multi-dimensional treatment plan that addresses not only your immediate pain, but also any possible underlying or co-existing conditions that may be causing or aggravating your symptoms. We’re here for you, and we want to help. Our goal is to return you to optimal health as soon as possible. Please call (703) 532-4892 to schedule an appointment, or for more information please click here. Evaluating Your Musculoskeletal System at the Kaplan Center. Resource: Massage Therapy: An Introduction A publication of the National Center for Complementary and Alternative Medicine (NCCAM). Article: Massage Therapy Holds Promise for Low-Back Pain by the National Center for Complementary and Alternative Medicine (NCCAM). Gary Kaplan, D.O. is the founder and medical director of the Kaplan Center for Integrative Medicine and author of Total Recovery. 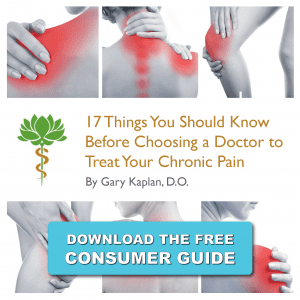 A pioneer and leader in the field of integrative medicine, Dr. Kaplan is one of only 19 physicians in the country to be board-certified in both Family Medicine and Pain Medicine. Dr. Kaplan is a Clinical Associate Professor of Family Medicine at Georgetown University School of Medicine and serves on the Advisory Committee to Health and Human Services for Chronic Fatigue Syndrome. NEWSLETTER Sign up now to receive articles, tips & updates!